How adorable is the cover of the So Much Closer German edition? In other So Much Closer news, Sadie will be returning as a main character in City Love. Which might not be news if you’ve already read the City Love synopsis. But yeah. I’m bringing Sadie back with her random acts of kindness and warm fuzzies, like the ones I posted on City Love trilogy’s Instagram. So get ready for some fun throwback moments! Sometimes I forget to look up. Which is a travesty here in New York. There is so much to notice when you look up in this city. Gorgeous architecture, skywriting, elaborate apartments, a bunch of red balloons floating away, rooftop gardens, intricate details on buildings like tiling and etching…the list is endless. That’s why John in So Much Closer is always trying to get Brooke to look up more. The other thing about looking up is that you get captured in the Now. The tons of people I pass on the street every day with their eyes glued to their phone is beyond depressing. That’s how you’re walking around one of the most captivating cities in the world? Staring at a screen? I can’t with that. This design is a good example of the elaborate, unique quality of so many New York City buildings. The building is actually pretty average when you see it at street level. You have to look up to see the good stuff. How sweet is that one round window at the top? How cool is it that those four rows of windows all have different designs? Buildings with dazzling tops fascinate me. 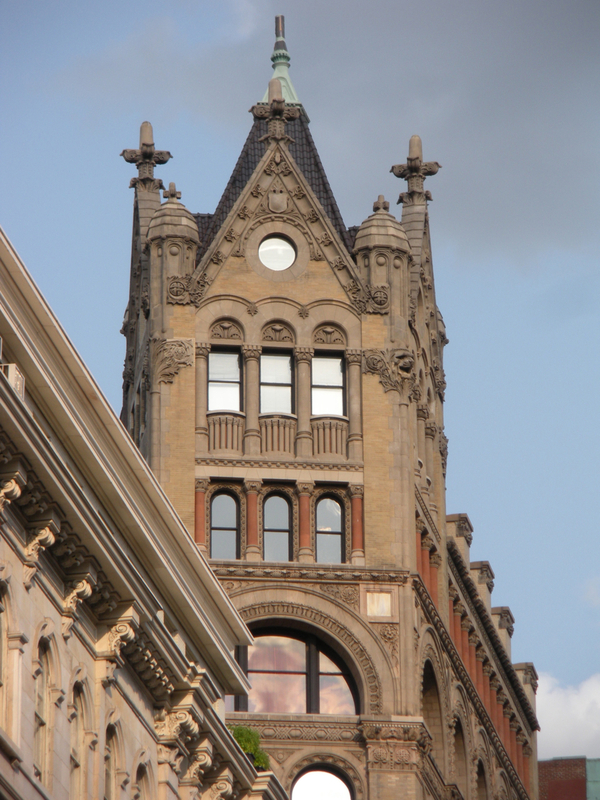 This building with its array of ornate details dazzles along with the best of them. Even though I look up and notice beauty like this a lot, I felt compelled to document the moment to share with you. I’ve been thinking about doing a series of Look Up posts featuring these images for a while. Maybe it’s time to start.